I’m pretty high on Findbroker. 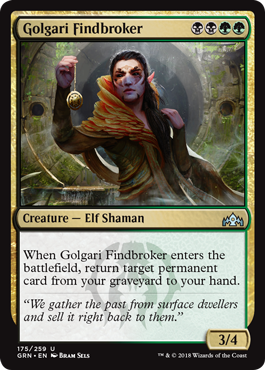 Golgari is already interested in self-mill, between surveil cards and things like Glowspore Shaman, making this ability much more than just draw a card. It also has a good stats-to-cost ratio, making it both card advantage and tempo advantage. I’m all over this, and even the difficult mana cost doesn’t give me pause.